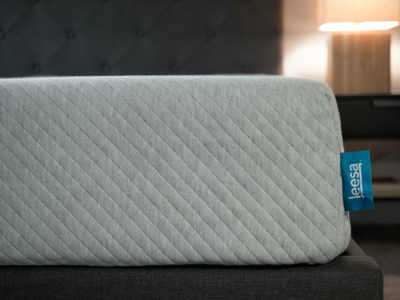 Home » Lull Mattress Review – Great For Back Sleepers? 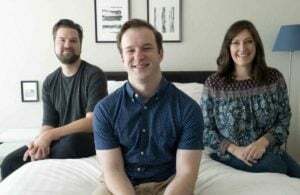 Lull Mattress Review – Great For Back Sleepers? Lull is a bed-in-a-box retailer that offers an all-foam mattress for a value price. 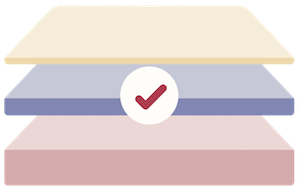 The Lull mattress incorporates three types of foam for a blend of comfort and support. In my experience, this all mattress is medium in terms of firmness. This means it could be an excellent option for back sleepers and some combination sleepers. Will you find comfort on this medium-firm mattress? Read on for my full review. 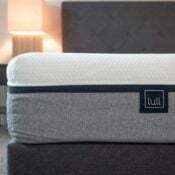 Lull is a great fit for those looking to get a slight memory foam feel and for those who sleep on their back or stomach. You can get $150 off right now by clicking through the link below. You Are A Light Or Medium Weight Combination Sleeper: If you sleep in numerous positions during the night and aren’t overly heavy, this could be a good fit for you. Being that this mattress is slightly firmer than average, it has a nice balanced feel that could give the proper support and comfort in a variety of sleeping positions. You Are A Back Sleeper: Medium-firm mattresses are often a good match for back sleepers. This mattress should give you the proper support, while still allowing your hips to sink in slightly. Your spine should stay neutrally aligned on the Lull. 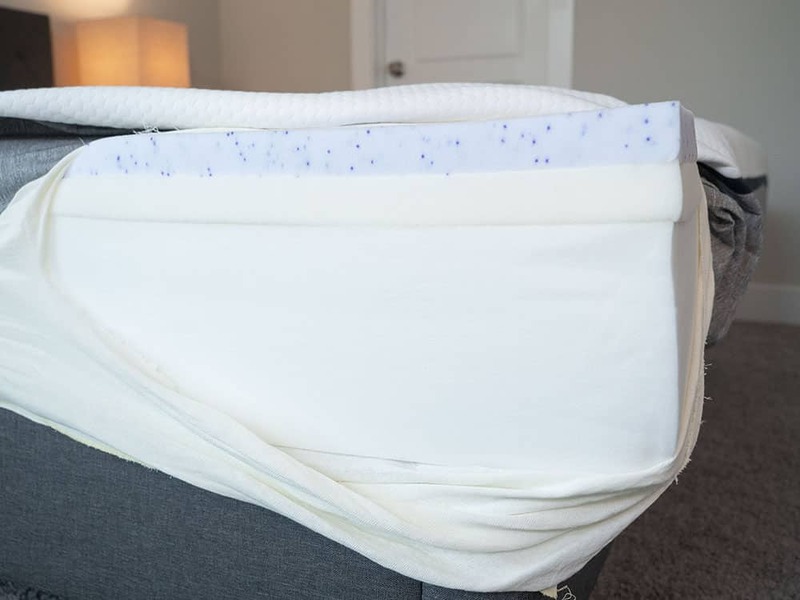 You Like A Foam Feel Without Feeling Stuck: You should get the pressure relief of a foam mattress while still being able to move around easily on the mattress. The soft top layer isn’t very thick, so you shouldn’t sink in too far. You Are A Heavier Side Sleeper: You may press through the soft upper layers and engage the support layers beneath. Because of this, you may find this mattress to be too firm, especially if you sleep on your side. You Are A Heavier Stomach Sleeper: This mattress may not be firm enough for if you are larger and sleep in this position. You may require more overall support to ensure you don’t sink in too far at the hips. You Prefer The Feeling Of An Innerspring Mattress: This is an all foam mattress, so you will get some of that slow compression that comes with memory foam. If you like the contouring and support of coils, this may not be the best match for you. First, there is a soft, thin cover. It is a premium blend of fabrics and is quite breathable. Then, there is 1.5” of a gel memory foam. This is soft and made for pressure relief. This is followed by 1.5” of a transition foam. This is there to transition you to the firmer support layers. Finally, there is a 7” base support layer. All the foam in the Lull is CertiPUR-US® Certified, so it is eco-friendly. The Lull is Made in the USA. The Lull is available in Twin, Twin XL, Full, Queen, King, and California King. The mattress works with an adjustable bed. The gel foam is quite slow to respond. This means it should be good for pressure relief. The top foam layer is injected with a gel polymer, designed to dissipate heat. This foam is also open-celled, meaning it allows for airflow. Overall, you shouldn’t be sleeping hot. Because the gel foam layer is so thin, heavier people may press through it and engage the support layers beneath. The mattress may seem firmer to larger side sleepers. According to the company, the Lull can support two people weighing up to 250 lbs. each. If you are close to or above the 250 lb. range, I would recommend looking at getting a mattress specifically created for heavier people. The table below shows the prices AFTER the $150 discount and dimensions for all the available sizes of the Lull mattress. On my back, I felt my hips sink in slightly, but I still felt nice overall support. On my stomach, I also felt the proper amount of support. On my side, I experienced nice pressure relief, but I did feel a bit of those firmer layers beneath. 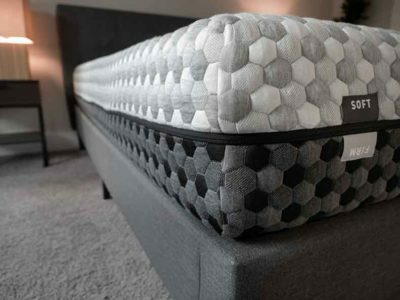 If you are a heavier person, you may find this mattress to be firmer than I did, as you press through the soft upper layers down to the firmer transition and support layers. At the same, this mattress may be too soft if you are heavier and sleep on your stomach. In terms of feel, you have a thin layer of memory foam on top, so you have a little bit of that soft, foam feel. However, together with the firm layers beneath, the mattress has a balanced feel overall. Being that it is an all foam mattress, I expected the Lull to perform well with motion isolation. There was barely any motion transfer during my tests. If you sleep with a partner, you shouldn’t feel them moving around. This could be a good match for couples. Memory foam mattresses often collapse when you sit near the edge. However, while there was some compression, I still thought the Lull had good edge support. Sitting on the edge, I didn’t feel like I was going to fall off. Likewise, lying down, I didn’t feel like I was going to be ejected from the mattress. This also makes it a good pick for couples. Joe felt it was close to a 7 for firmness. For me, it was closer to an 8. On my side, I definitely press through the top layers down to the support layers underneath. I felt a little bit of pressure on my shoulders and my hips. On my stomach, I needed more support overall. I was bowing in. On my back, this is where the mattress really worked for me. On my back, I felt good support overall along with nice comfort. If you are a back sleeper and you are my size, this might be a good choice for you. Marten’s experience fits with my thoughts on the mattress. He is heavier, so he has some issues on his stomach and side. However, it did work well for him when he was on his back. This matttress could definitely be a good choice for back sleepers of many sizes. This mattress gives good pressure relief without you feeling stuck. While the top layer is very soft, the transition layer keeps you from sinking in too far. The Lull feels comfortable, but it is still easy to move around on the mattress. The Lull is great for medium and lighter weight combination sleepers. If you sleep in a variety of positions during the night and you aren’t overly heavy, this mattress should give the proper support and comfort. Its medium firmness makes it a good match for back sleepers of many sizes. Whether you are lighter or heavier, you should find comfort if you sleep on your back. The open-celled foam promotes airflow and cooling. Together with the breathable cover, this should keep you from sleeping too hot. The Lull mattress is one of my preferred bed-in-a-box models, especially at this price range. It offers great support, and is one of the few mattresses I recommend for people that sleep in multiple positions throughout the night. Overall a good option. The Lull is a bed in a box mattress, which means it will come compressed and be shipped straight to you. You will want to begin by removing the rolled up Lull mattress from its box. Then, preferably with another person’s assistance, position the roll on your bed. Carefully cut the away the first layers of plastic until the still-compact mattress can be laid down flat. Then, pierce through the final layer of plastic and the Lull will expand. Simply clear away the excess plastic and allow your mattress to breathe and fully expand. 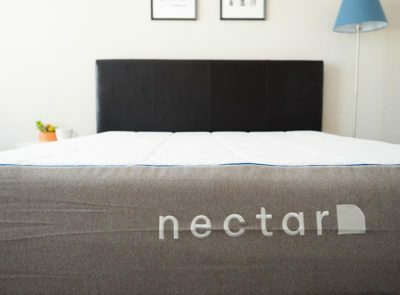 This medium-firm mattress could be a great match for back sleepers of many sizes. In addition, lighter and medium-size sleepers should find comfort and support in numerous positions. Heavier side and stomach sleepers may require more support in those positions and may wish to seek a firmer mattress. The Lull comes with a 100 Night Risk-Free Trial and 10 Year Warranty. Financing is available along with free shipping. I see medium-firm mattresses are widely used today, so this mattress has the medium-firm tension that is good. With so many mattress choices it is difficult if not frustrating when making a decision. while a mattress is a personal decision, for me it is one that has already been proven to be life changing. I have spinal issues and have had surgery on my l5/s1 disks to correct, but continued to have pain. My wife and I attended a home show were a bed company Rims was showing their foam mattress adjustable bed and after looking at it we decided to purchase thinking it would help. To my dismay, instead of helping with my back, the mattress has caused me to have severe hip and shoulder pain. I’ve been diagnosed with bursitis, treated with men’s, therapy, injections, needles you name it without helping the problem created by this mattress. After a year on this mattress and working with RIMS with no positive relief, I purchased a stearns pillow top. For the first 8-10 months it helped, but now I am once again in severe pain in my hip and both shoulders. I need to find a mattress that will help, I am suffering. What is your sleeping position(s)? I noticed you don’t answer certain questions when there seems to be a negative connotation. Is there a reason? That wouldn’t be intentional. Some slip through the cracks that I don’t see/get a chance to answer. I’m bedbound and suffer from severe chronic pain. Do you think this would be a good mattress for someone who is in the bed 90% of the time? I can’t make that call. I would ask your doctor. I have seen a few comments from others saying that you can’t use box springs with these mattresses otherwise it will cause soft spots???? They recommended bunkeeboard or a solid piece of wood. Any thoughts? Box springs should be fine, but if you’re hesitant just go with what they recommend. I’m thinking of replacing an aging inner-spring mattress with a memory foam design like you described. I’d like to know how long the Lull mattress is expected to last with proper care. Always hard to say. Probably 6-8 years. My husband says he has a tough time sleeping because he gets hot. Does this mattress really keep you cool through the night? 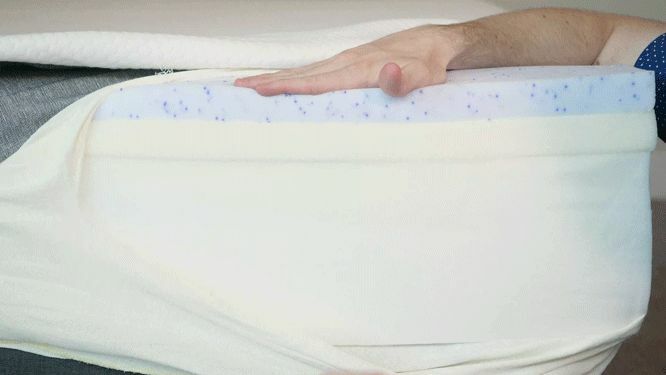 It does a pretty good job, but check out this article if it’s a major concern, https://www.mattressclarity.com/reviews/best-cooling-mattress-hot-sleepers/. How does the Bear mattress compare to to the Lull mattress? Hi Jean – they’re pretty similar, biggest difference would be the feel (check out my feel videos in each review for the difference). Bear also has some recovery-specific material that interests some shoppers. Is this mattress for a heavy person of 243 lbs? What about edge support? Is it suitable for sitting on the edge to put your shoes on? Or does it sink too much? I am allergic to latex. I see the Lull has a layer of latex. Should this be a bed I should avoid? Hi Shelly – the Lull actually has “latex-like” foam, not actual latex. Not sure how that would effect your allergy, I would speak to them directly with those concerns. After reading reviews, I am torn between the Lull mattress and the Loom & Leaf mattress. I sleep “hot” – otherwise really like the feel of memory foam. I also have a pet peeve about mattresses that lean down toward the sides. Any thoughts? Thanks in advance – so appreciate your reviews! What about Off Gassing? Need a new mattress for my 18wheeler and would like to try a memoryfoam but don’t want the smell. There will be some smell initially, but I found that it was totally gone after ~48 hours. also, i only have a metal frame, no headboard nor footboard, will it be strong enough? do you need a traditional box spring, or does this mattress require another type? Hi Terry – you don’t need a box spring, platform bed or slats work just as well. However if you only have a metal frame, you will need a box spring. If you were recommending a mattress with a firm bounce that would be used solely for amorous activities what would it be? If that’s your main goal, innerspring is the best! Do I need a box spring with a lull ? Not required, but can be used if you prefer it. About a year ago we bought a Beautyrest Pillow Top mattress. After a few months both of us developed back pain and sciatica. Lately, I’ve been sleeping on a Futon on the floor, and my back pain is reduced, but not gone. Is this mattress adequate for an adjustable base? Thanks. Hi Marie – yes should be fine with an adjustable base. 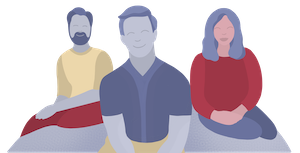 Hi Debbie – I get this question a lot, and while I don’t think certain mattresses “target” pain, a good mattress that supports you well and keeps you aligned will definitely help with pain. I’ve had a Tempur-pedicure mattress for 10 years which I loved. I was hoping to get a less expensive mattress. We are trying out a Relaxed firm Loam & Loft it is too firm for us. Which mattress is the closest to a classic Temper-pedic feeling ? Thank you ! I’d check out the Novosbed soft next. Hi. Are you planning to review a Zenhaven mattress in the near future? Already reviewed – check out my take here. We have a traditional (20+ year old) California King waterbed frame that we put a conventional box spring & mattress in (it has 6 drawer on each side and cupboard space in between). Unfortunately, there’s a lip on the footboard that goes over the end of the mattress (making it VERY difficult to change sheets, etc.) Can the Luff mattress be ordered by an odd size (i.e., shorter than the average CalKing)? Does anyone have any comments on the smell? I bought a memory foam mattress and couldn’t stand the smell…. There is a smell to almost all of the bed-in-a-box options initially (Lull is no exception), but I found the smell to be gone within 48 hours. Any readers have a different experience? We currently have an older Sleep Number Bed and usually keep the firmness around 40-45. We are not as happy with it as we were the first couple of years. We have back and shoulder issues. Do you think the Lull Mattress would suit us? Hi Jo-Anne – generally I do like Lull, but it’s going to be a very different experience than Sleep Number. We are on I think our third mattress, and still no luck. First Dream Foam, didn’t work at all. Then we have tried Tuft and Needle – comfortable but woke up with horrible back pain. We are now trying Helix. Still having back issues but did like the ability to ‘build’ a mattress. We are using twin XL’s for a King size bed. Should we just give up on foam and go back to innerspring? Any advice I would appreciate it. Hi John – depends, what didn’t you like about Dream Foam and T&N? Many memory foam products smell of a strong chemical. What about lull? Any suggestions for online mattresses that delivery to Canada? We are side sleepers and my husband has a shoulder injury. 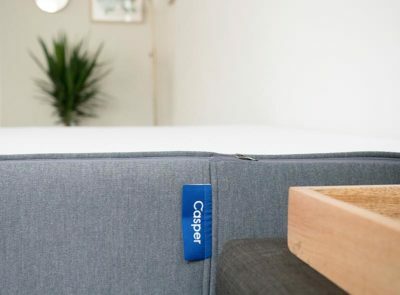 Off the top of my head – Casper, Leesa, and Endy are all good side-sleeper options (somewhat similar to Lull) that ship to Canada. Is there a box spring you would recommend to go with the mattress? I would want one so that the bed would be a little bit higher that it would with only a mattress. Really any good quality box spring will do – you just want a firm supportive layer for the mattress to sit on. can you use the mattress on traditional beds or is it too heavy? I noticed it was placed on a very sturdy looking bed with no box spring. Hi Darlene – this mattress is actually not too heavy (relatively), should work just fine with a traditional bed.